Newborn Screening - Just A Few Drops Of Blood Can Change A Baby's Life - That's Sick! pass through the capable hands of approximately 20 people. Twenty people they will probably never meet on the fourth floor of a UW-Madison campus building they will probably never visit. At the Wisconsin State Laboratory of Hygiene, five drops of blood from a prick of their newborn baby's heel are used for newborn screening, a 50-year-old ritual of public health will likely come and go with little more than a cursory mention from a doctor. Or it may save their baby's life. Infant with bandaged heel after collection of blood sample. "We screen almost 70,000 infants every year for rare diseases that can be detected and treated very early, but could cause very serious health problems and sometimes death if they aren't diagnosed very soon after birth," says Mei Baker, a University of Wisconsin–Madison pediatrics professor and co-director of Wisconsin's pioneering Newborn Screening Laboratory. Today, chemists at the state lab test a baby's blood sample for 44 uncommon disorders that fit an early-detection, early-intervention model, annually identifying about 125 children with diseases. 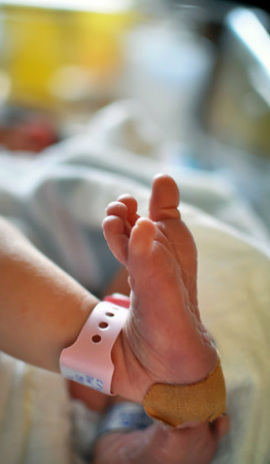 "These diseases are unrecognizable at birth, at least by routine physical examination, and it's not feasible to test prenatally," says Patrice Held, co-director of the Newborn Screening Laboratory with Baker. "We have an opportunity to identify and treat babies with these diseases before they develop serious health problems." The 44 disorders range from the well-known Cystic Fibrosis (CF) to the relatively obscure (a metabolic disorder known as "Maple Syrup Urine Disease") to the relatively famous Severe Combined Immunodeficiency (SCID), or "bubble boy" disease, which has its own made-for-TV movie starring a young John Travolta. Wisconsin's own newborn screening started in 1965 with testing for Phenylketonuria (PKU), a genetic disorder that prevents the conversion of phenylalanine in food into the amino acid tyrosine. The mandatory tests were initially performed in hospitals around the state, and the few babies who tested positive were immediately switched to a diet low in phenylalanine and rich in tyrosine. "Before that, PKU would go undiagnosed and cause mental retardation, and that would require society to provide long-term care in an institution," Baker says. "I know personally from talking to people around the state that some institutions have had to close over the decades because the need is reduced." In 1978, the list of disorders grew and testing was consolidated at the hygiene lab, where workers now punch eighth-inch dots of blood from sample cards collected 24 to 48 hours after birth. 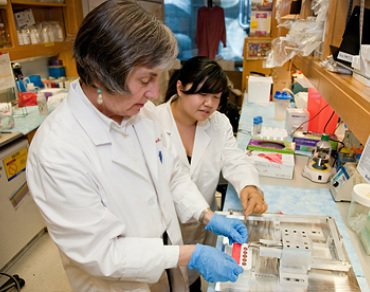 Dr. Jennifer Puck from the Department of Pediatrics and the Clinical and Translational Science Institute at University of California, San Francisco, extracts DNA from dried blood spots, in preparation for severe combined immunodeficiency screening (SCID, sometimes referred to as ‘bubble boy disease’). Abnormal results are immediately communicated to primary care physicians and program clinical consultants by newborn screening case managers. The comprehensive program also covers hearing loss with a test performed on newborns before they leave the hospital. And as available technology and new treatments develop, so does the list of screened diseases. Research at the state lab and UW-Madison helped develop the now-widespread test for cystic fibrosis, and the state's process for review and refinement of screening is a model now used around the country. Samples being screened for Severe Combined Immunodeficiency (SCID) in New York State. "We were also the first in the world to routinely test for SCID, and our process and experience have been shared with many states and countries to help them to implement their own SCID screening," says Baker. SCID remains the only one of the 44 diseases that can actually be cured. The other 43 can be managed with an array of treatments, if caught early. So, six days a week the lab processes blood samples, looking for the rare abnormal result. Because many general practitioners may never have seen a patient with one of the rare diseases, the screening program, which is administered by the Wisconsin Department of Health Services, includes a network of specialists as the program's clinical consultants. The specialists work with primary care physicians to devise treatment, and the screening program follows the infants who screen positive for a disease until they receive a confirmed diagnosis and begin proper treatment. "We want to be certain that the babies identified through newborn screening are cared for, so that they can become healthy, playful children and productive adults," Held says. "That's what makes newborn screening an excellent example of a very effective, comprehensive public health program," Baker says.